A calcaneal spur, or commonly known as a heel spur, occurs when a bony outgrowth forms on the heel bone. Calcaneal spurs can be located at the back of the heel (dorsal heel spur) or under the sole (plantar heel spur). The dorsal spurs are often associated with achilles Tendinopathy, while spurs under the sole are associated with Plantar fasciitis. The apex of the spur lies either within the origin of the planter fascia (on the medial tubercle of the calcaneus) or superior to it (in the origin of the flexor digitorum brevis muscle). The relationship between spur formation, the medial tubercle of the calcaneus and intrinsic heel musculature results in a constant pulling effect on the plantar fascia resulting in an inflammatory response. There are numerous muscles (Soleus, gastrocnemius, plantaris, abductor digiti minimi, flexor digitorum brevis, extensor digitorum brevis, abductor hallucis, extensor hallucis brevis, quadratus plantae) and the plantar fascia which exert a traction force on the tuberosity and adjacent regions of the calcaneus, especially when excessive or abnormal pronation occurs. The origin of the spurs appears to be caused by repetitive trauma which produces micro tears in the plantar fascia near its attachment and the attempted repair leads to inflammation which is responsible for the production and the maintenance of the symptoms. The etiology of spurs has been debated. Heredity, metabolic disorders, tuberculosis, systemic inflammatory diseases and many other disorders have also been implicated. Current reasoning is that abnormal biomechanics (excessive or abnormal pronation) is the prime etiological factor for a painful plantar heel and inferior calcaneal spur. The spur is thought to be a result of the biomechanical fault and an incidental finding when associated with a painful plantar heel. The most common etiology is thought to be abnormal pronation which results in increased tension forces within the structures that attach in the region of the calcaneal tuberosity. Asymptomatic heel spurs are relatively common in the normal, adult population. One epidemiologic study found that 11% of the adult U.S. population had developed a calcaneal spur which showed up on incidental radiographic finding. The painful heel is a relatively common foot problem, but calcaneal spurs are not considered as a primary cause of heel pain. A calcaneal spur is caused by long-term stress on the plantar fascia and foot muscles and may develop as a reaction to plantar fasciitis. The pain, mostly localised in the area of the medial process of the calcaneal tuberosity, is caused by pressure in the region of the plantar aponeurosis attachment to the calcaneal bone. The condition may exist without producing symptoms, or it may become very painful, even disabling. Most heel pain patients are middle-aged adults. Obesity may be considered a risk factor. Not all heel spurs cause symptoms and are often painless, but when they do cause symptoms people often experience more pain during weight-bearing activities, in the morning or after a period of rest. The pain, however, is not as a result of mechanical pressure on the spur, but from the inflammatory response. Type B spurs extend forward from the plantar fascia insertion distally within the plantar fascia. The mean spur length for type A is significantly longer statistically than the mean spur length for type B, although patients with type B spurs reported more severe clinical pain. There are those which are large in size, but which are asymptomatic, because the angle of growth is such that the spur aggravated through weight-bearing and/or the inflammatory changes have halted. The 2nd type are large, but painful on weight-bearing, because the pitch of the calcaneus has been changed by a depression of the longitudinal arch and, as a result, the spur may become a weight-bearing point, sometimes causing intractable refractory pain. This 3rd type has only a tiny amount of proliferation and its outline is irregular and jagged, usually accompanied by an area of decreased density around the origin of the plantar fascia, indicating a subacute inflammatory process. All calcaneal spurs undoubtedly begin in this manner, but only a few become symptomatic at this stage, because the etiologic factors are acute. As chronic heel pain is a common manifestation of many conditions, these must be excluded before planning treatment. Diagnostic imaging as well as medical signs are often used to differentiate some of the conditions that are mentioned below from calcaneal spurs. Ottawa Ankle Rules, Radiography, MRI (isotopic bone scan) and ultrasound. A diagnosis is based on the patient's history and on the results of the physical examination. Diagnosis is usually confirmed by X-ray, but other diagnostic adjuncts are also used. Radiology may show calcaneal spur formation or calcification at either the insertion of the Achilles tendon or the origin of the plantar fascia. Rarely is an MRI required. There are different aspects that need to be taken in consideration when performing the clinical examination. Is range of motion limited in the ankle and foot, especially passive dorsiflexion of the toes? Is there any atrophy of the heel pad in comparison with the other foot in combination with reduced muscle strength? Are there any skin tears on the foot? Any difference in foot alignment in comparison with the other foot? ‘The clinical practice guideline revision 2010 outlines different phases, divided in tiers. If a certain tier reduces symptoms, treatment should continue. If no improvement is reported, then treatment moves to a higher tier. Some treatments are proven effective in treating plantar fasciitis, but not in the presence of calcaneal spurs. Those recommendations can, therefore, only be used when the calcaneal spur is associated with plantar fasciitis. In the guidelines, this treatment received a grade C recommendation. This grade may change in the future pending new research. December 2015: “RM is as effective as PF in the treatment of plantar fasciitis. Patients who underwent both procedures experienced no benefit and a higher rate of complications.”  For long-term efficacy a larger research cohort is needed. Calcaneal spurs, both upper and lower spurs, are treated with conventional physiotherapy. Using this method, there is evidence that the re-irritation of the painful heel spur is a safe and effective treatment. There was a significant response for at least 2 years in reduction of pain , although a placebo effect can occur . There is, however, still no clear decision on what dose is the most effective, either 1.0 Gy or 0.5 Gy. Cold therapy may be used to relieve inflammation and reduce pain. Heat therapy to loosen tense muscles and promote oxygen and blood flow to the affected area. Thermotherapy might be useful for the reduction of pain during exercises. ● Conventional therapy includes ultrasound, laser treatment, passive and active stretching and strengthening of the muscles of the legs, cold and hot applications (Contrast Bath). The aim is to eliminate inflammation surrounding the spur. This treatment programme may take 6 to 12 months for symptom resolution. ● Conservative treatment: While conservative treatments can help reduce the symptoms of bone spurs, they do not always treat the source of your pain. ● Radial shockwave therapy consists of very high energy mechanical waves, directed at the plantar fasciitis, to help reduce inflammation. Various studies do suggest that ESWT is not an effective treatment for plantar fasciitis. (Buchanan et al. 2002, Haake et al. 2003) This discrepancy between studies means that further support for an effective treatment with ESWT is needed, because there was a remarkable positive effect of ESWT pointed at the calcaneal spur, but the difference between the presence and absence of a calcaneal spur was not significant enough. According to De Vera Barredo et al. (2007) night splints, massage, taping, acupuncture, walking casts, laser therapy and cryotherapy are more effective. The effect of orthotics is only relevant when the calcaneal spur is related to plantar fasciitis. A conservative treatment in combination with the use of a night splint that keeps the ankle in 5-degree of dorsiflexion for eight weeks; Patients without previous treatments for plantar fasciitisobtain significant relief of heel pain in the short term with the use of a nightsplint incorporated into conservative methods; however, this application does not have a significant effect on prevention of recurrences after a two-year follow-up. Footlogics: provide relief from Plantar Fasciitis (heel pain and heel spurs), achilles Tendinopathy and also forefoot pain. Aims to correct over-pronation, fallen arches and flat feet. Calcaneal spurs are bony growths at the back of the heel (dorsal) or under the sole of the foot (plantar). 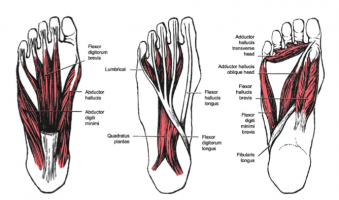 Dorsal spurs are associated with achilles tendinopathy and plantar with plantar fascitis. Their etiology appears to be linked with repetitive trauma to the associated muscles and tendons with attempted repair of micro tears causing inflammation and pain. Abnormal biomechanics is thought to the reason for this reaction. Pain is commonly felt at the heel, affected gait and weight bearing, but differential diagnosis has to be excluded to the number of possible conditions for an appropriate treatment protocol. X-ray is an effective diagnostic tool. Management can either be medical or non medical depending on an individual's response. ↑ Buccilli TA Jr, Hall HR, Solmen JD. Sterile abscess formation following a cortico- steroid injection for the treatment of plantar fasciitis. J Foot Ankle Surg 44:466– 468, 2005. ↑ Lee, Gregory P, John A. Ogden, and G. Lee Cross. "Effect of extracorporeal shock waves on calcaneal bone spurs." Foot & ankle international 24.12 (2003): 927-930.